Movies are a great source of knowledge. They can scare you, enlighten you, inspire you, bore you, entertain you, upset you, enthrall you..they can instill just about any emotion in you. When someone initially told me to watch movies as a part of recovery, I thought they were ridiculous. 'Movies? ', the intellect snob in me sneered, 'how are movies going to help me?' Oh how unaware I was at the time! Movies are a powerful resource and I encourage everyone to watch them. They can reawaken emotions that you thought you would never experience like excitement, happiness, fear or shock. They help you to create your own opinions about what you liked or disliked about the film. They force you to escape from your own thoughts for an hour or two. They're an antidote to rumination. As it's Tuesday, I'm going to share with you a movie that I found really inspiring and I hope you will watch it. It's called 'Freedom Writers'. It's a movie based on a book written by Erin Gruwell who was a teacher. It's based on true events, which makes it even more inspiring I think because then what she did can truly happen and who she is really exists. The film is about a teacher who recently moved to a new area in America. She was a really passionate teacher who had a vision of making a change to her pupils education experience. What she was met with on the first day of her new job threw her a little bit. It wasn't quite all rainbows and sunshine to say the least. The pupils in her class are all involved in street gangs and some in violence. Her mission to teach them looks like an impossible task. I won't ruin the story line, but I will share what I found inspirational about the film. Although the teacher could have walked away from the job as her father told her to, she didn't. She was a strong and determined woman who knew her values. She believed in her ability to turn the situation around. She never gave up. She had a dream and she wasn't going to let a few hurdles knock her down, rather she was going to knock the hurdles down instead. She broke barriers. She adapted to a situation and found new ways to approach things. She didn't give up on the pupils because she knew that was part of the reason why they were in so much trouble. People kept giving up on them. She had a vision for change and she passed that vision on to the pupils. They believed that they were trapped in their circumstances and were fated to relive the lives of the generations before them. This woman showed them otherwise. That's what makes this movie great. 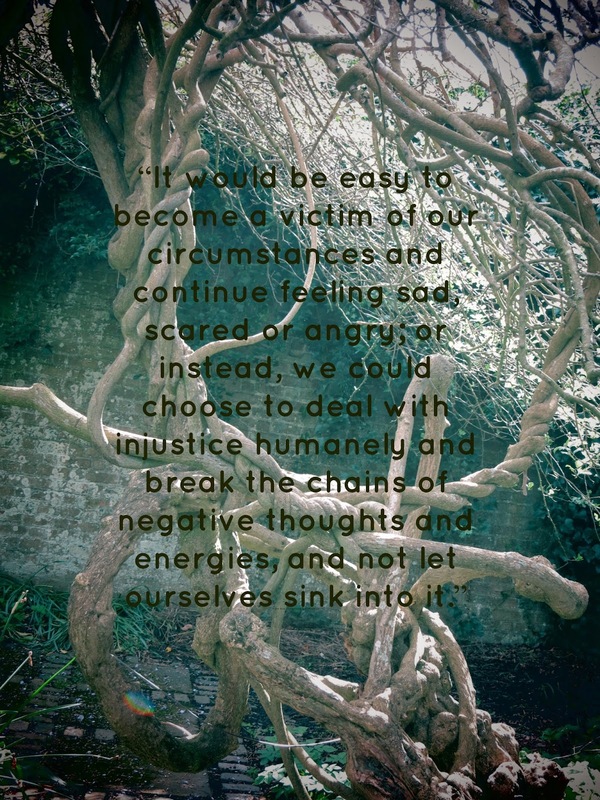 We don't have to be victims of our own circumstances. If we are in challenging situations, we don't have to remain in them. If we educate ourselves, we can move out of that space. We can flourish and develop into who we want to be. We can achieve our dreams when we put the work in to get them. We can remain locked in our negativity, every day living in guilt or shame, feeling as though we don't deserve the life we have. Well to be honest, you do. We all do. We all deserve life and it is our duty to live it. Don't feel guilty about the past, just take action to ensure that the future is better. The teacher in the film inspired her pupils to realise that they have a choice in their futures and that they can create a different path for the next generation. And so can we. We need to become images of inspiration, not of desperation if we want the next generation to have a hope of living freely, without the insecurity that could potentially damn them. The onus is on each of us to live our lives in a way that makes us feel proud. Inspire yourself - look at all that your amazing abilities. it may seem frivolous at first but look at your body - it is a living machine - it allows you to move, to feel, to express, to LIVE. Your legs carry you every day, your arms and hands can create, make, mend, touch. Your brain is the powerhouse and generates your thoughts and ideas. You are an amazing creature and it's about time we all realised this. So today, watch a movie. Take yourself out of your thoughts for a while. It can be any movie, (even Disney ones! They're swimming in deep meanings actually!) just as long as you watch it. After watching it, ask yourself if you found any part of it inspiring? Ask what did you learn from the movie? Did you find yourself feeling any emotions during it? Also after watching the movie, give yourself credit. And watch another one..